Mystic Slots Video Slot Guide & Review - Casino Answers! Mystic Slots is a 5-reel, 9-line video slot, featuring a wild symbol, a free spins feature and a bonus game. You can play Mystic Slots at US-friendly online casinos Juicy Stakes Casino and Bovada Casino. Bets on Mystic Online Slots are $0.10, $0.20, $0.50, $1, $2, $3, $4 and $5 per line. You can play 1-9 lines per spin, which you can select by using the “Lines” button. The lowest you can bet on a spin on the Mystic video slot is a dime per spin up to $45 per spin. To play all 9 paylines, hit the “Bet Max” button. For other bets, use the “Spin” button. The highest paying symbol on the Mystic slot game is the Bat symbol. 5 Bat symbols on an active payline will pay out the top jackpot of 5000 coins. The Orb symbol is another high paying symbol at 3000 coins, whereas the Spell Book will pay out up to 1500 coins. The Werewolf symbol is the wild symbol on the Mystic video slot and substitutes for any symbols, except the scatter and bonus symbols. It does not pay at all by itself. The scatter symbol on Mystic Slots is the Mummy symbol. If you hit 3, 4 or 5 Mummy scatter symbols anywhere on the reels of Mystic Slots, you will trigger 3, 7 or 10 free spins. There is an autoplay mode available if you’re looking to play up to 100 autoplay spins without clicking the “Spin” button 100 times. Hit the “Auto Spin” button to select 10, 20, 50 or 100 autoplay spins. You can cancel autoplay at any time. 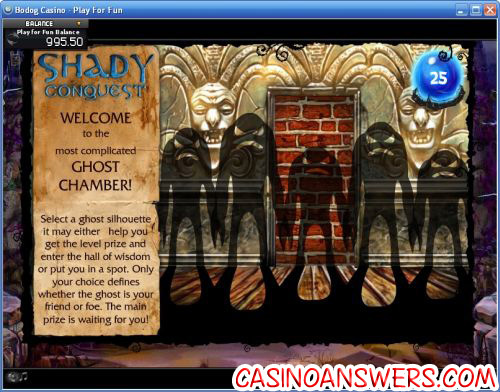 Mystic Slots makes for a great slot machine to play around Halloween time or any time if you’re a major horror buff. To play Mystic Slots, use the coupon code DealerDan at Juicy Stakes Casino! Where can I play a free Flash game of Mystic Slots? Juicy Stakes Flash Casino and Bodog Flash Casino both offer an Instant Play version of Mystic Slots great for Macintosh users. You can play for free in practice mode or for real money. 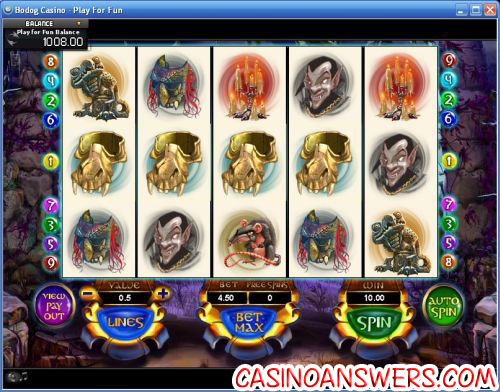 If you have trouble getting Mystic Flash Slots to work, try downloading the latest version of Adobe Flash Player. Can players from the United States play the Mystic Slots game for real money? American players can play Mystic Slots at either Juicy Stakes Casino or Bovada Casino. How do I get to the bonus game on Mystic Slots? You can make it to the bonus game by hitting 3 Dracula symbols anywhere on the reels. In the bonus game, you must select three different items to win prizes. Is there a progressive jackpot on Mystic Slots? While there isn’t a Mystic Slots progressive jackpot, you can play for numerous progressive jackpots at Juicy Stakes Casino and Bodog Casino. You can read our Fruit Salad Jackpot Progressive Slot Review, Gold in Bars Progressive Jackpot Slot Review, Hot 7’s Progressive Jackpot Slot Review and World Cup Soccer Spins Progressive Jackpot Slot Review. Where can I play the mystic slots flash game?